One of the many challenges of pregnancy is that you can’t take many medications while pregnant. Luckily, there’s one simple solution for morning sickness that’s completely drug free: acupressure. Pressing on the acupressure points on your inner wrists, called the nei kuan points, often helps alleviate nausea, whether it’s caused by morning sickness or a bumpy car ride. The gentle, continuous stimulation causes the nervous system to release chemicals that help trigger the body’s natural healing abilities, according to numerous scientific/medical journals, and control nausea. You’ll find several products on the market that stimulate these points, and one is Sea-Band Nausea Relief Wristbands. These cloth and elastic wrist bands have plastic studs that apply gentle pressure to the acupressure points. Sea-Bands bands work within five minutes after being applied and can be worn at the onset of nausea and for as long as needed or reused if nausea returns. 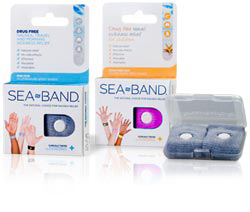 You can buy them online at www.sea-band.com or in stores.